Manufacturer & Exporter of Black PVC Coated Aluminum and GI Sheets. Our product range also comprises of PVC Laminated GI Sheets, PVC Laminated Aluminium Sheets and PVC Coated Aluminum and GI Sheets. 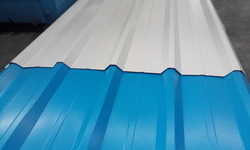 Backed with a team of highly skilled professionals, we are involved in offering a wide range of Black PVC Coated Aluminum and GI Sheets to our highly valued clients. Moreover, the material comes in a range of colors and finishes, including a photo-effect wood finish, and is used as a substitute for painted wood, mostly for window frames and sills when installing double glazing in new buildings, or to replace older single-glazed windows. Other uses include fascia, and siding or weather boarding. 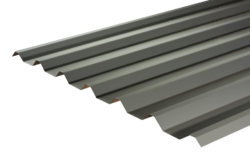 We are acknowledged amongst one of the prominent names in the industry of presenting to our customers a wide spectrum of PVC Coated Aluminum and GI Sheets. These sheets are placed around discontinuities or objects which protrude from the roof of a building to deflect water away from seams or joints and in valleys where the runoff is concentrated. Appreciated for their high quality, fine finish and durability these offered sheets are widely demanded among our clients. Moreover, these are accessible with us in different stipulations and as per the patterns asked by our clients to attain the highest level of customer satisfaction. Looking for Black PVC Coated Aluminum and GI Sheets ?